Dr. Jacob Gutsche, left, and perfusionist John Haddle wheel a mobile ECMO unit through a hospital hallway. The mobile ECMO units enable Penn Medicine's lung rescue team to airlift patients in respiratory failure, boosting their chances of survival. For Jeffrey Ache, the first symptoms of a months-long ordeal that nearly snatched his life began with little alarm. Ache, 59, of Hanover, York County, visited his doctor on April 1, 2018 with flu-like symptoms. After recording a 102.7 degree fever, the doctor sent Ache to Hanover Hospital for a chest X-ray. The results were negative. Ache went home with instructions to take some aspirin. Two days later, Ache's symptoms worsened so badly that his son, Anthony, rushed him back to the hospital. This time, doctors informed Ache that he had double pneumonia and the flu. His health was dire. "That's the last thing I remember." Seven weeks later, Ache woke up from a medically-induced coma at Penn Presbyterian Medical Center in Philadelphia. He had a long recovery in front of him, but he was alive, thanks to an innovative program designed to rescue desperate flu victims. Penn Medicine had dispatched its lung rescue team to airlift Ache from Hanover Hospital. Once in Philadelphia, they placed him on an Extracorporeal Membrane Oxygenation (ECMO) machine, a life-supporting device that essentially functioned as his lungs. That allowed his doctors to address the underlying causes of his respiratory failure. Had Ache not rushed to Hanover Hospital that night, doctors told him he likely would have died in his sleep. "It's just a miracle I'm here," Ache said. "That's it in a nutshell." Ache's full recovery is remarkable, given that for weeks his chances of survival looked bleak. But there are many others with similar stories. Each year, the Penn Lung Rescue Team saves dozens of patients from acute respiratory failure, rushing throughout the tri-state region to airlift – and treat – patients in need of critical care. 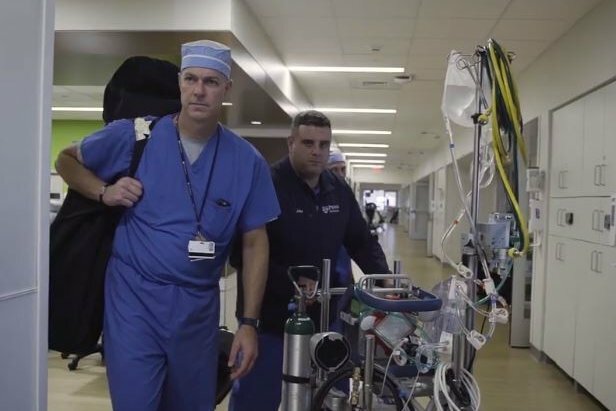 Many of those patients require ECMO to be initiated before leaving the community hospital, a relatively new capability that only Penn offers in the Philly region. When flu season rolls around, the need for such life-saving services increases exponentially. "During that three-to-four month period, we'll do as much of this as we do the whole rest of the year combined," said Dr. Jacob Gutsche, co-medical director of the Penn Lung Rescue Team. "We get really busy." 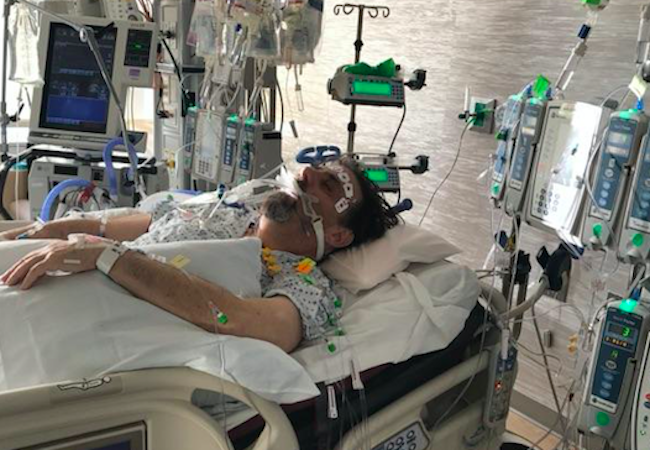 Jeffrey Ache was in a medically-induced coma for seven weeks after he fell into acute respiratory distress syndrome following complications from the flu. 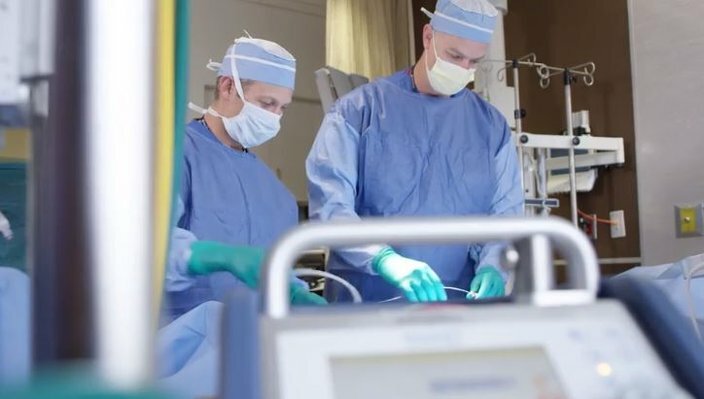 Penn Medicine launched its lung rescue program in December 2014, becoming just the third health care institution in the United States to offer mobile ECMO services. Several others have since joined them, but mobile oxygenation services remain uncommon throughout much of the country. Medical centers have long administered ECMO to patients within their doors. But mobile ECMO units enable providers to bring the life-saving technology to the patient. That has opened new possibilities for patients taken to their local hospitals, who otherwise might be too unstable to be airlifted. The Penn Lung Rescue Team team has responded to patients at hospitals throughout Pennsylvania, New Jersey and Delaware. "Five years ago, we would have to fly those patients over (without ECMO)," Gutsche said. "They were very unstable – so unstable that about a third of the time they would get CPR on the way over. ... A lot of those patients die. Or they would stay at their own hospital and die there because they couldn't get to us." ECMO units draw blood from a catheter inserted into a central vein, pumping it into an external chamber that removes carbon dioxide and replenishes oxygen levels. The blood is then pumped back into the body through another vein. "It basically replaces the function of those lungs that are so sick," Gutsche said. "It buys us time to help recover the patient's native lungs so that they can survive." The Penn Lung Rescue Team has administered mobile ECMO to at least 110 patients since the team launched, Gutsche said. Another 200 or so patients, like Ache, have received ECMO after being airlifted to Penn. Dr. William Vernick, left, and Dr. Jacob Gutsche operate on a patient. As part of Penn Medicine's lung rescue program, they have responded to hundreds of patients experiencing respiratory failure in the tri-state area, airlifting them to Philadelphia. The team has transported patients suffering from pulmonary embolisms, autoimmune disorders or heart attacks. One patient suffered from babesiosis, a tickborne parasite that infects red blood cells. But often times they see influenza patients, like Ache, who fall into acute respiratory distress syndrome. "They'll come in feeling sick to the ER and then very quickly they'll go through this rapid collapse where their lungs don't work," Gutsche said. "We do all kinds of things to improve the function of their lungs, with no improvement. Even despite being on a ventilator, with sedation and muscle relaxants ... they still do so poorly they are about to die." That's when Penn's Lung Rescue Team receives a call. Either Gutsche or Dr. William Vernick – the other co-medical director – are on call at all times, ready to assemble a rescue squad at a moment's notice. Each team includes at least one physician, a perfusionist, a flight nurse and a pilot. "It's resource-intensive," Gutsche said. "You can imagine, it takes somebody like me or Bill Vernick who says, 'I don't mind getting called in the middle of the night.' It's a lot of work. There's not a lot of programs out there, partly because that type of investment is needed." The financial cost of running such programs also presents a hurdle. Mobile units costs about $100,000 – considerably more than a standard unit, Vernick said. To launch a program, an institution needs several machines because patients often stay on them for weeks at a time – as Ache did. When patients require ECMO for lung failure, their survival rate generally is around 50-to-60 percent, Gutsche said. Penn's survival rate, at about 75 percent, is among the highest in the country. "There's patients that no doubt, without ECMO, would be dead," Vernick said. "We're not taking patients that are borderline. We're taking patients that would have had no chance whatsoever." 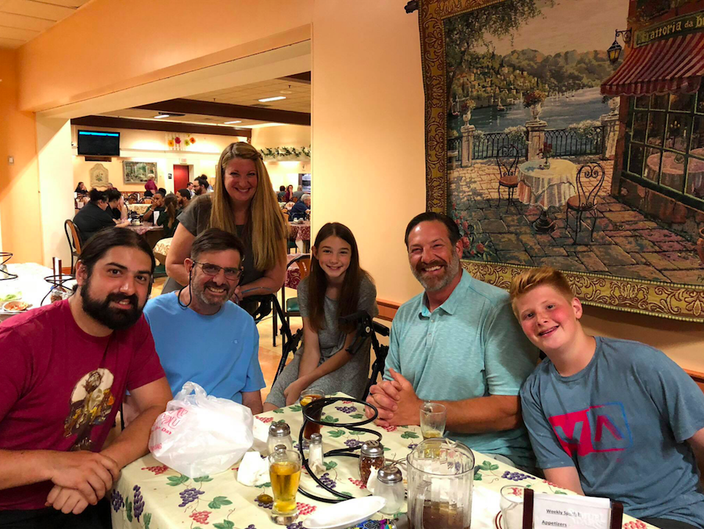 Jeffrey Ache, second from right, enjoys a meal with his family. From left to right: his son, Anthony Ache; his brother-in-law, Rock Witmer; his sister, Andrea Ache Witmer; his niece, Sara Witmer; and his nephew, Alexander Witmer. Anthony Ache remembers the day his father first showed signs of emerging from his coma. It had been weeks since the airlift to Penn. The Ache family had stayed by Jeffrey's bedside throughout the ordeal, including his daughter, Carla, who flew in from California. They took shifts at the hospital, watching as Ache at times teetered on the verge of death. "It got to the point where he wasn't making the progress that needed to happen," Anthony Ache, 32, said. "They didn't know if he was going to be in a vegetative state. ... Everybody is barely hanging on. Then one day, he started wiggling his toes." Soon, Ache opened his eyes. Slowly, he emerged from the coma. At last, his family had cause for optimism – though Ache had a long journey before him. He needed to regain his strength and relearn to walk. "I couldn't understand why everyone was so happy," said Ache, who could barely move when he first awoke. "The doctors told them it was their hell when I was out and when I woke up, that's when my hell began – the recovery." In time, Ache was transferred from Penn Presbyterian's heart and vascular unit to the intensive care unit. He was discharged later to Good Shepherd Rehabilitation and eventually sent to live for three weeks with his parents, who have an elevator in their house. "We were pretty much at the hospital most of the time and at the rehab most of the time," said Andrea Ache Witmer, Jeffrey's younger sister. "We were so close to him dying that it was so hard for us to feel a little bit of hope. Because we didn't want to jinx it." At last, he returned to work in August and soon found himself playing golf again with his son. And he has been big believer in receiving an annual flu shot – a vaccination he'd never had before. "I have a new appreciation for the little things," said Ache, an accountant at an engineering firm. "I'm kind of an emotional guy and I get upset about things. I try to tell myself, they say you shouldn't be here realistically. Don't get upset on the little stuff." Witmer, 52, of Shillington, Berks County, documented her brother's journey in a photobook given to him last year. During scary moments at Hanover Hospital, Witmer had suggested reaching out to Penn Medicine, having completed her dentistry schooling there and knowing its highly-regarded reputation. The family remains grateful to the many Penn providers who helped to save Ache's life and walked him through recovery. Anthony Ache called Gutsche the family's "patron saint." Witmer labeled him a "guardian angel," adding that Vernick also was "awesome." Still, Witmer struggled to put her gratitude into words. "It's a miracle," she said. "That's what I can say – they're miracle workers."